Congratulations to Candy Lynn for winning the prize!! The top voted costume was letter “A” the Cheshire Cat and Mad Hatter Costumes!! Thank you to everyone for participating and sharing your thoughts on the costumes so far!! We can’t wait until next Halloween!!! We are close to 50,000 “Likes” on Facebook so we decided to have a GIVEAWAY for all our YARNutopians!! I want to share my appreciation for hitting 50K followers by doing a fun little Facebook GIVEAWAY!! I am offering a magical Halloween Themed Box of yarn that retails $200+ USD!!! Follow the directions below to enter! All tasks must be complete for you to be entered into this giveaway. You MUST have a US Address to participate in this giveaway! If a winner is chosen and they do not have a US shipping address, a new winner will be chosen. 2. Choose your favorite costume from years past in the photo below, then go to YARNutopia’s Facebook Page, Leave a comment on the pinned post about this GIVEAWAY with the letter of your favorite costume! (A, B, C, or D)–Your comment MUST be on the Facebook post. Any comments on this blog post will not be entered to win the yarn. The participants who vote on the costume with the MOST votes will all be entered in a RANDOM drawing to win the giant bundle of yarn in the photo above!! This giveaway will run starting TODAY, RIGHT NOW, October 12th, 2018 and end on October 14th at 11:59pm CST. The winner will be randomly selected on October 15th. I will announce the winner here and on Facebook and I will try to contact you personally. This giveaway is in no way affiliated with Facebook. Happy Halloween from Willy Wonka and the Oompa Loompa! Get the crochet pattern for the Adult Sized Knickers Nate is wearing here! Get the crochet pattern for the Vertical Striped Leg Warmers Nate is wearing here! 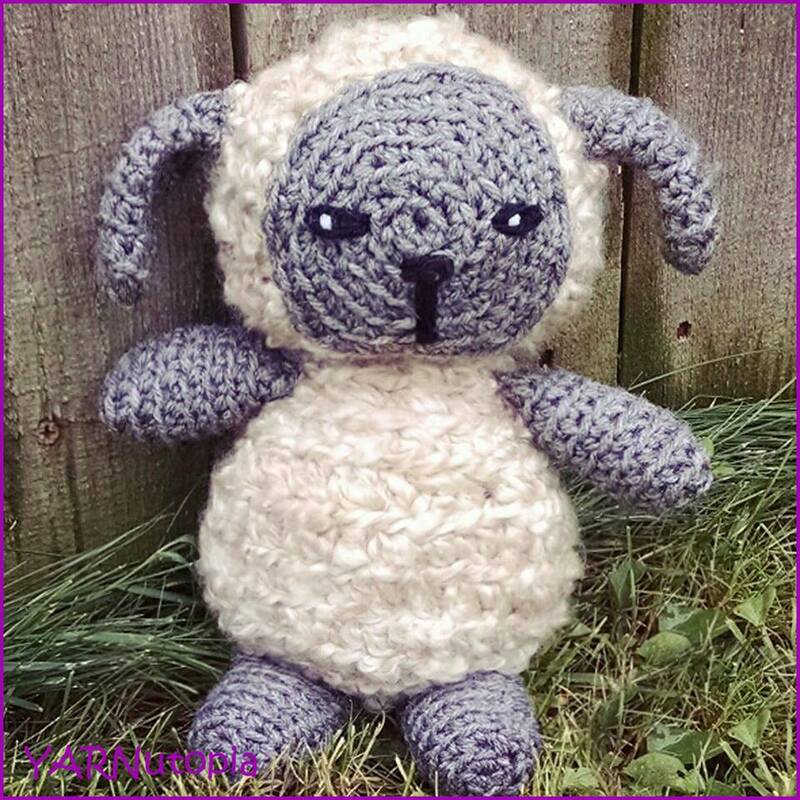 Get the crochet pattern for the lollipops here! Get the pattern for the cardigan Nadia is wearing here! Get the pattern for the Top Hat Nadia is wearing here! Get the pattern for the Green Wig Nate is wearing here!! For those who are working with me on this costume, here is the latest addition to my ensemble! My Princess Armor for the shoulders is a powerful detail in the overall costume and will definitely help make this outfit look that much more authentic! As these pieces come together toward my final creation, it has made me more excited to finish! Slowly but surely, this outfit will come to fruition as I work toward this masterpiece which is sure to WOW! -Your foundation chain on any of these pieces can be more or less than what I made, if you need to make this bigger or smaller. -My shoulder piece measures 20 inches (51 cm) across from outside of the shoulder to the other side. –Craft Floral Wire or you can find Craft Floral Wire here too! Add wire around edge and SINGLE CROCHET around the entire piece putting 3 SC in each corner. For the Swirls on the shoulder pieces, you can easily chain about 75 and sew on the chain to the shoulder piece. You can embellish your shoulder pieces as much as you want. In the video tutorial I added 2 swirls to each shoulder. Do not fasten off. Add wire around edge and SINGLE CROCHET around the entire piece. For the lines on the inner shoulder pieces, you can easily chain about 15 and sew on the chains to the shoulder piece. (See video and photos for visual guide) You can embellish your shoulder pieces as much as you want. In the video tutorial I added 2 lines to each inner shoulder piece. Sew on blue jewel to center of inner shoulder piece. Sew Inner shoulder piece to outer Shoulder piece. Round the outer shoulder piece to fit around the inner shoulder piece. Do the same thing for both shoulders. Row 1: SC in the 2nd Ch from the hook and in the next 2 Chs, HDC in next 3 chs, DC in next 3 Chs, HDC in next 3 Chs, SC in last 3 Chs, CH 1, turn. Row 2: Sl st in first 3 sts, 2 HDC in next 3 sts, 2 DC in next 3 sts, 2 HDC in next 3 sts, Sl st in last 3 sts, ch 1, turn. Rnd 1: [2 SC, 2 HDC, DC, 2HDC, 2 SC, Ch 2, sl st to first SC] in 2nd ch from hook. Use the video tutorial for visual instructions on how to sew all the front pieces together. Weave in all your loose ends. Sew the half circle piece BEHIND the crescent pieces. Attach a Blue Circle Jewel to the center of the Half circle as well. See video tutorial and photos for visual guide. Sew front piece to each shoulder piece. Then go on to making the back piece. Make a chain for a triangle embellishment for the center of the back. Sew it on just like the swirls on the shoulders. Attach back piece to each shoulder piece. Weave in the rest of your ends. Like this costume piece? Try the Destiny Headband to match!! You can also add the Princess Costume Gloves to this ensemble here! An enormous amount of improvising was done in the creation of this princess dress that I made for my Halloween costume. Nate and I are attending a costume party this year and I was all set to make sure that this was created in time. But boy, did I underestimate how hard it would be to make this ensemble! In the process, I ran out of yarn, I had to frog my work a few times, and actually shed a few tears. The skirt wasn’t as voluminous as I hoped, but you know what, it doesn’t matter anymore! I finished it, and I am getting passed the flaws to appreciate the work that went into making this. Overall, it may not be exactly what I imagined, but once in awhile a project takes on a life of its own and still turns out alright! This pattern is for the basic dress design. However, you can change color. Add or subtract embellishments or details to customize your own costume. Pick a princess you love and go for it! Whether it be yellow like the one in this tutorial or pink, blue, a blue top with yellow skirt, green. Modifying this for any character can bring your costume to life! Click here or click the image below to see the video tutorial and written pattern for the Enchanted Rose Cape. Once the shell of the costume was made and the side panels added, I used similar colored tulle to enhance the sides giving the skirt full scallop look. I sewed the tulle in the sides and tucked it in the center then secured the entire piece with a center rose. I used the medium size rose flower from my Floral Dream Crown pattern. Using a corset style lace-up, I used ribbon to create a closure for the shirt. Simply tying it down the back creates this look. I wrapped tulle around the shoulders of the top and using a couple stitches, I secured it into place. I added another rose in the center bust area to tie in this design with similar details as the skirt. -The pattern video tutorial starts at 8 minutes 14 seconds. The first 8 minutes are frequently asked questions and other information. -You can use any cotton/acrylic/polyester yarn you want to use. As long as it’s a thinner and lighter weight yarn. Having so much yarn can result in a heavy skirt. -You can use a smaller or larger hook to make this smaller or bigger depending on your tension. -For measurements and to learn how big mine turned out to be, watch the beginning of the video tutorial. For the top, I measure it as I go. -This took me approximately 12 hours to complete fully. Row 1: FDC 140 or any multiple of 14 that measures your hip measurement PLUS 6-10 extra inches. Round 2: Form FDC round into a ring and slip stitch to the beginning FDC. (See video tutorial for visual instructions), ch up 2, DC in first 5 sts, *3 DC in next st, DC in next 5 sts, DC3TOG, DC in next 5 sts, repeat from * ending with DC3TOG. Round 3: (See video tutorial for visual instructions at 20 minutes), Do not slip stitch to beginning, DC in first 5 sts, * 3DC in middle DC of 3DC grouping, DC in next 5 sts, DC3TOG, DC in next 5 sts, repeat from * around, do not slip stitch to beginning. Continue working in continuous rounds. Rounds 4-65: * DC in next 5 sts, 3DC in middle DC of 3DC grouping, DC in next 5 sts, DC3TOG, DC in next 5 sts, repeat from * around, do not slip stitch to beginning. You can make this as long or short as you want just repeating the continuous pattern. Go onto the next step when when you are satisfied with the length. Round 66: Skip the next st, sl st into the next st, ch 1, sc in same st, sk 2 sts, 5 DC in next st (shell made), *sk 2 sts, sc in next st, shell in next st, repeat from * around, sl st to beginning sc. Fasten off. Attach yarn on any st around waist. Ch up 4. (Counts as TR), TR in each st around, sl st to ch up 4. Fasten off. Weave ribbon through the TR’s to tighten waist. Ch 4, sl st to 4th ch from hook to form a ring. Row 15: Ch 3, 1 DC in each st across, turn. Row 16: Ch 3, DC in same st, [1 DC in next 7 sts, 2 DC in next st] Repeat across. (90) Fasten off with long tail for sewing. Sew panels to sides of skirt using video tutorial as a visual guide. Row 2-30: DC in each st across. You can continue to make it longer if yours isn’t long enough. Row 2: Ch 2, DC across. Fasten off with long tail. There is a video tutorial for this flower that can be found here. Row 1: sc in 4th ch from hook (first ch 1 sp made). * Ch 1, skip 1 ch, sc in next ch. Repeat from * to end. Row 2: Ch 1, turn, [2 sc and 1 sl st] in first ch 1 sp, [3sc, 1 sl st] in each of the next 3 ch 1 sps, [3 hdc, 1 sl st] in each of the next 4 ch 1 sps, [4 hdc, 1 sl st] in each of the next 4 ch 1 sps, [4 dc, 1 sl st] in each of the next 4 ch 1 sps. Fasten off with long tail for sewing. Roll strip into a flower, stitch flower together at base. Why not make the matching Beast set? Below, click the image to take you to its video tutorial and written pattern. This is the 4th piece of the Cheshire Cat costume. It is a very simple pattern. There is no video tutorial since this is a continuous repeat pattern. 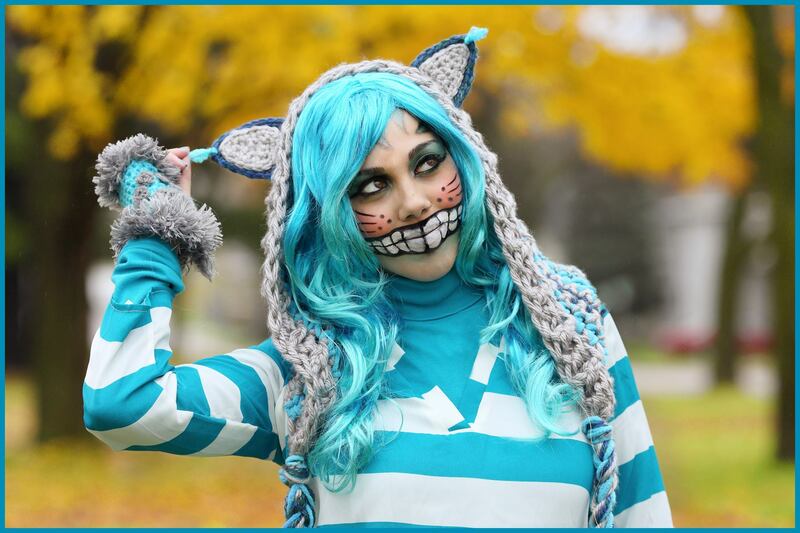 This particular tail was made for the Cheshire Cat costume, however, this can be modified to be crocheted for any type of tail for any costume! The length can be changed to accommodate any size. It can be made short or long. Enjoy this pattern and leave a comment! If you are interested in making the full costume, You can find the Leg Warmers pattern here. You can find the Hand warmer Paws Pattern here. And you can find the Top Hat that Nate is wearing right here! Enjoy! Change color every 10 Rounds. Work In continuous Rounds, moving stitch marker up each round. Add stuffing as you go, I found it easier to stuff after every 10 rounds. Rnd 8-60 (or however long you want to make it): Sc in each st around, change color after rounds 10, 20, 30, 40, and 50. Apply fur at the tip of the tail by sewing it on. Sew end closed and weave elastic through and wear around your waist, or sew the end closed and pin it to your pants! Click this photo to learn how to make the paws!